Henna is the most widely used natural colorant all over the world. Women as well as men love to use Henna to cover their grey hair and some use Henna to dye hairs as a fashion. Henna does not work like other hair coloring products available in the market. Henna is a harmless product with no disadvantages at all. Its color is reddish brown which is temporary and last from 1 to 3 weeks. 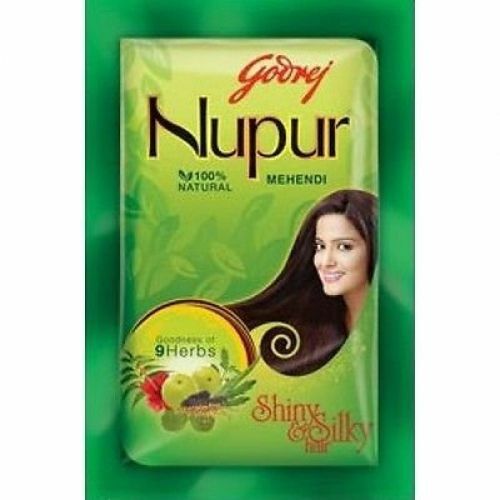 Nupur Henna is the product of Godrej which is famous all over the world. Nupur Henna is an Herbal treatment for hair which has several benefits. It has been formulated with the goodness of 9 herbs which improves the health of hairs and treat hair and scalp problems. It is healthy and free from harmful chemicals. Is Nupur a Natural Product? Nupur Henna has total 10 ingredients and all these ingredients are natural and Herbal. There is no artificial or chemical additive in it. It is safe and have no reported side effect. Nupur have 9 healthy herbs which have been selected from the farms of India. These herbs are Henna, Brahmi, Shikakai, Aloe Vera, Methi, Bhringraj, Amla, Neem, Hibiscus & Jatamansi. Neem: fights with dandruff and scalp infection. How to Use: Soak Nupur henna for 2-3 hours in water. Apply it your hair evenly. Wait until the paste dries. Wait for at least 3 hours. Rinse it with plain water. You can add curd in it to get extra softness.